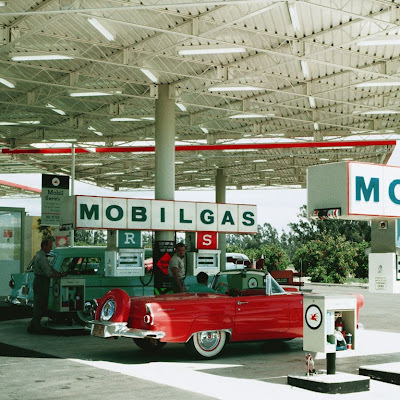 Can a gas station inspire awe? We think it can. 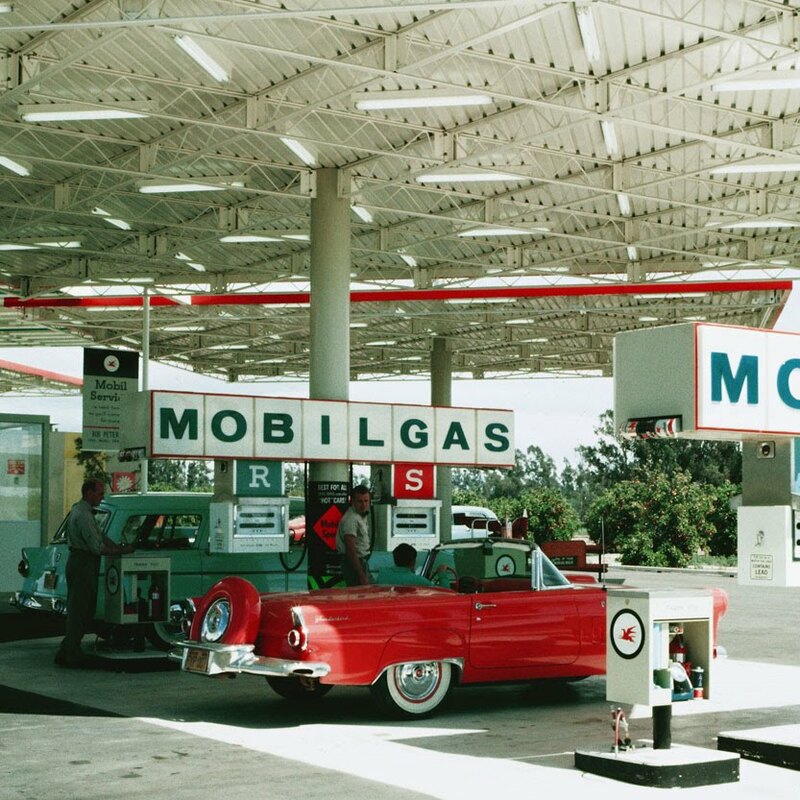 This marvelous modern Mobil once adorned the intersection of Harbor and Katella, catty-corner from Disneyland's expansive parking lot. Its four exuberant canopies were arranged in a neat diamond pattern - each magically balanced on a single central support - and topped by a flying red Pegasus. For these images, architects Whitney Smith and Wayne Williams enlisted the talents of their friend, famed photographer Julius Shulman. 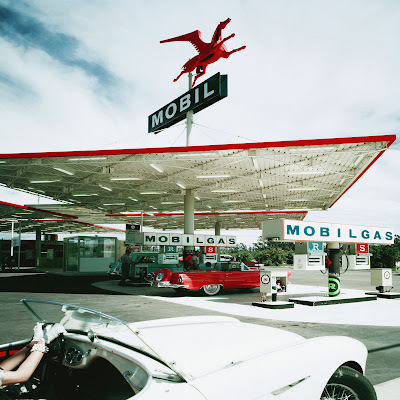 Shulman staged the photo on the spur of the moment, with a customer's red car and the wife of one of the architects, driving her own Austin-Healey convertible, with white gloves, in the foreground. 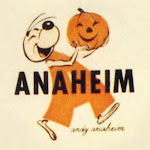 Anaheim's ubiquitous orange trees, loaded with fruit, border the blacktop in the distance. In his book Googie Redux, historian Alan Hess notes "This is another example of an established high-art architect who took the purpose and forms of roadside architecture seriously." 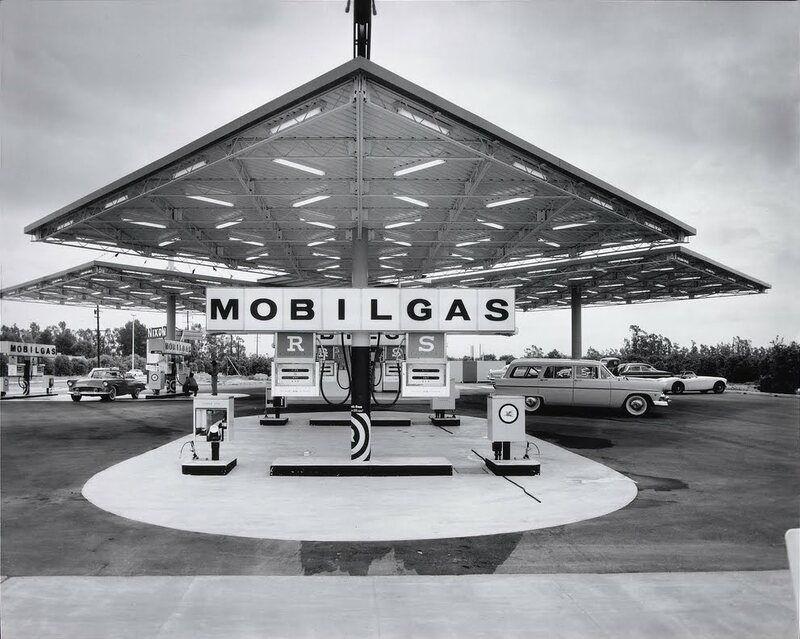 Julius Shulman was one of the leading architectural photographers of the 20th century, developing a close association with many Modernist architects. 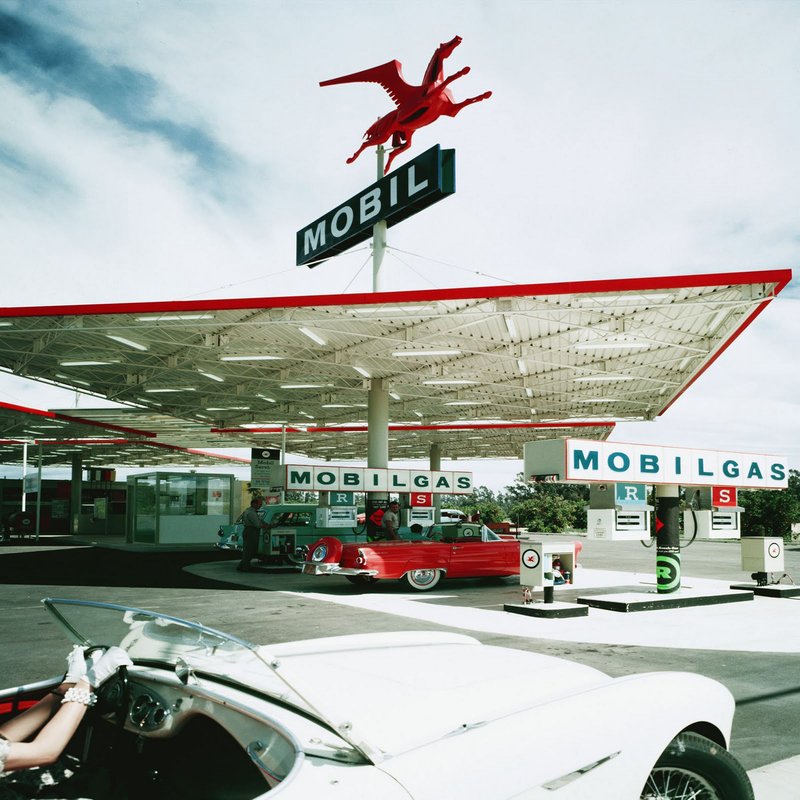 His work played a major role in crafting the perception of the "Southern California lifestyle" to the rest of the world during the 1950s and 1960s. 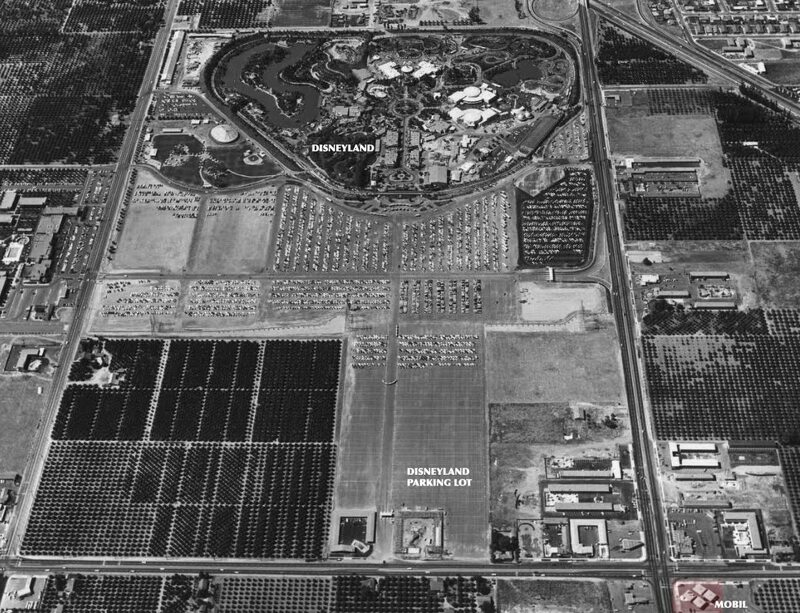 And here's where it was... in the bottom right corner of this 1958 aerial view. Today the property is an empty lot surrounded by chain link fence. 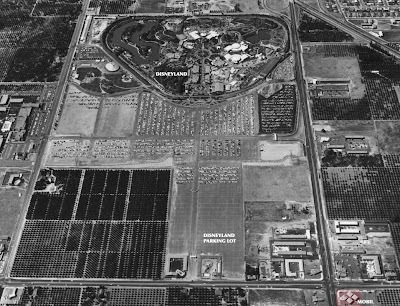 Wow - so much I miss about the architecture that once surrounded Disneyland... Thanks for sharing this! An amazing structure, and an amazing photo. 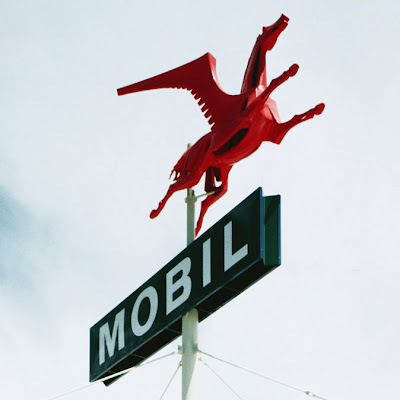 I've always loved Mobil's Pegasus logo too; that giant sculptural version is the greatest. I'd lop off my favorite pinky for that big rad red pegasus! What a gaddam dream that would be to have spinning above my NYC apartment - or maybe I'd drop in a flathead, pop on some steelies and ride that pegasus around like a true iron horse! Btw that Pegasus was designed by Millard Sheets and sculptor Albert Stewart....quite a statement about the high quality of everyday architecture in midcentury California!